You may well have been browsing eBay today looking for last-minute, cheap bargains and stumbled across the original SSC Ultimate Aero TT that currently holds the Guinness (apt given today is St Patrick’s Day!) World Record of the top speed for a production car. The 2007 model hit 257MPH and comes with 1183 horses housed in a twin-turbo V8, Palladium Paintwork, Alcantara interior, Satellite Navigation (always handy when racing in straight lines! ), 10-speaker Audio/DVD system and reversing camera. Bidding is currently approaching Half a million US dollars, and I am afraid you will have to pre-register before you bid. Official website at http://www.worldrecordcarauction.com/ but it seems to be overloaded at present. 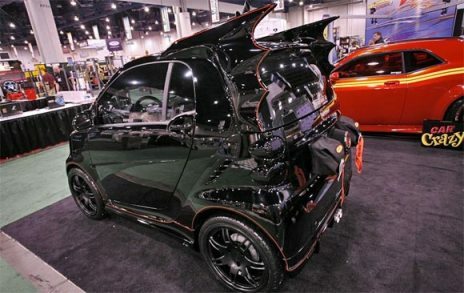 If that is a bit to rich you could always check out the ‘BatSmart’ below at a cool $8000!